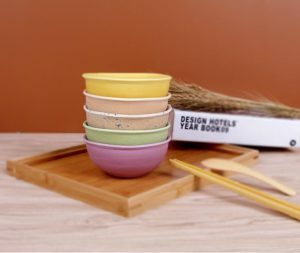 Edible tableware is made from food crops, non-staple foods and condiments. The food crop is flour made of wheat, rice, corn, etc., and the non-staple food and seasoning are eggs, vegetables, meat, salt, sugar, and the like. Can make a variety of flavors, healthy and delicious. All kinds of foods account for 70-90% of the weight percentage, and the non-staple foods and seasonings account for 10-30% of the weight percentage. Main practice: 70~90% flour, 3~5% egg, 2~4% refined oil, 2~5% flavoring, 1~3% vegetable, 2~5% meat, loosening agent 1-3 %, after being mixed, puffed into a sheet, and then steam-sprayed, the sheet is compounded, and then steamed on the surface thereof to form a protective film, and finally formed by press molding. 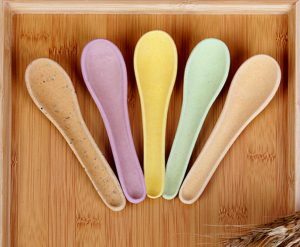 Edible tableware is made of high-quality wheat, sorghum, rice and other crops. It is baked at high temperature. It is non-polluting from production to disposal. Its unique performance is an unparalleled substitute. It is safe, hygienic and non-toxic. Harm, rapid decomposition, low carbon and environmental protection.